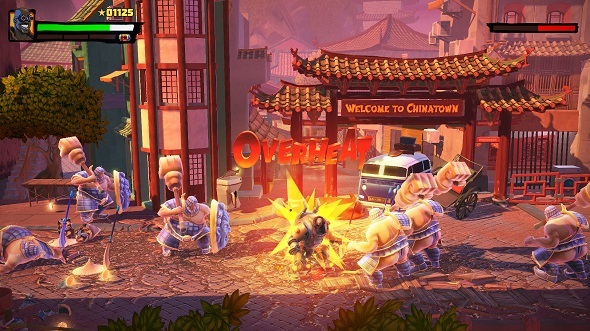 Side-scrolling throwback brawler Shaq-Fu: A Legend Reborn has been wending its way through development since its Indiegogo campaign in 2014, and the game is now near enough to its June launch that it’s gotten an ESRB rating – “T for Teen,” thanks mostly to a raunchy sense of humor. While you wait for Shaq-Fu, try some of these certified classics: Old PC games that are still worth playing. The ESRB’s description provides some new details on the reboot of the 1994 Shaquille O’neil-based game: Playing as Shaq, you’ll have to “rid the world of demons” by beating up various celebrities, who are actually demons in disguise. It’s not the most clever of premises, no, but Shaq-Fu was never really aiming for highbrow. The board notes a scene where horns grow from a female character’s breasts, as well as a “demonic, disembodied buttocks” that emits poison gas. You can read the full ratings breakdown here if you’re still unsure of what the game is about. Is the world prepared for another Shaq-centric brawler, almost 25 years later? We’ll find out soon enough. Shaq-Fu: A Legend Reborn will launch on PC via Steam, Xbox One, PlayStation 4, and Nintendo Switch June 5. You can find out more at the official site.